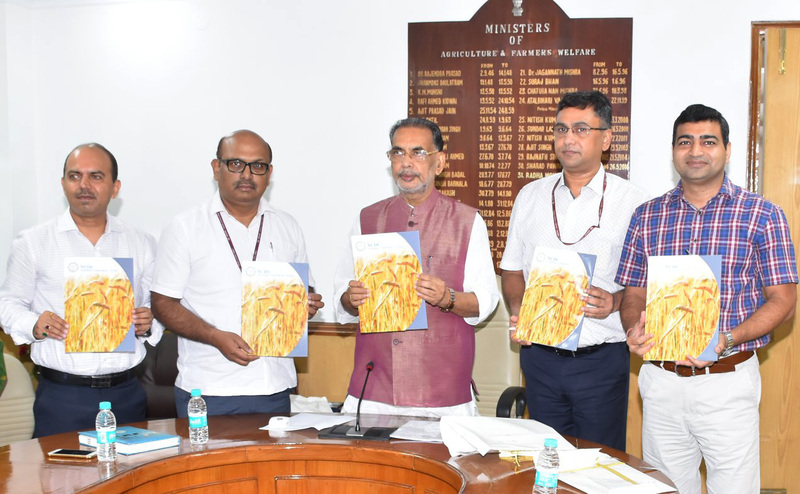 Union Minister of Agriculture and Farmers’ Welfare Radha Mohan Singh released a booklet titled ‘NCDC-Assisting Cooperatives. Always!’ highlighting the role and activities assisted by National Cooperative Development Corporation in Krishi Bhawan, New Delhi on Tuesday. Singh said that NCDC is the most preferred financial institution in the world of cooperatives and aligning itself with the Mission of New India 2022, it has embarked on Sahakar 22, a Mission for Doubling Farmers’ Income by 2022. Singh recalled that NCDC nurtures cooperatives which represent by and large small and marginal farmers. Some of its recent initiatives have been the support for the Integrated Cooperative Development in five remote districts of Nagaland and three districts of Andhra Pradesh. Listing NCDC’s other initiatives Singh mentioned Meghalaya Milk Mission, Modern Cooperative Banking Units in West Bengal, Farm Mechanisation in West Bengal, livelihood through goatry, sheep rearing and fisheries in Telangana, Cooperative Banks in Kerala and Rajasthan, women dairy cooperatives in Rajkot, Gujarat. NCDC has also been active in the procurement operations of farm produce in the State of Andhra Pradesh, Chhattisgarh, Madhya Pradesh, Odisha, Telangana, Uttar Pradesh, West Bengal etc, the Minister recalled. The Union Agriculture Minister while complimenting NCDC on its excellent performance since 2014 stated that the booklet now released will spread the word about its innovative support among the cooperatives. It is true that NCDC team along with its MD and Deputy MD has redefined the philosophy of the cooperative lender. Known for its stringent lending norms it has diluted its terms of offering loan in recent years and has practically hand-held those co-operatives who show promise. “Why should anyone take loan from us, DN Thakur, Deputy MD had said to us in an interview; it is the quality of service and positive attitude that goad co-ops to approach us”, he answers himself unraveling the rise of NCDC in recent years from Rs 4000 crore in 2015 to Rs 24000 crore in 2018. NCDC’s rate of interest is no less compared to other commercial lenders but its wholistic approach to handhold its customers make the difference, said Thakur. Indian Cooperative has learnt that Union Minister Radha Mohan Singh has also lent a helping hand and stood by NCDC when it decided to dilute its lending terms. “We go by the work a co-op does and this insight explains why the recovery rate of NCDC is more than 99 per cent”, explained Thakur unveiling the spirit of a changed NCDC.